Well, it had to happen some day. I’ve found an issue in a project we are using @ work. I’ve created a fix and I want to share it!. So this project is hosted on github, and it is indeed simple to add fixes. It will then show you if it can be merged at all. Add some information and you are done! I’ve created a rather simple fix. We are using the “Fluent.Ribbon” for a modern look and feel. But some of our controls are still winforms. 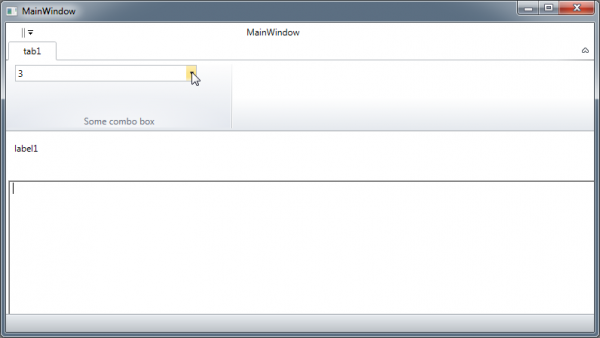 There is nothing wrong with winforms, but a mixture of wpf and winforms is not always ideal. System.Windows.Data Error: 8 : Cannot save value from target back to source. BindingExpression:Path=IsDropDownOpen; DataItem=’ComboBox’ (Name=’StyleCbx’); target element is ‘ToggleButton’ (Name=’ToggleButton’); target property is ‘IsChecked’ (type ‘Nullable`1′) NullReferenceException:’System.NullReferenceException: Object reference not set to an instance of an object. Turns out that the fix was rather simple. The combobox of fluent expected the Keyboard.FocusedElement, to always be non-null. Well this is not the case when dealing with a mixed technology window. So the fix was created and a pull request has been offered. 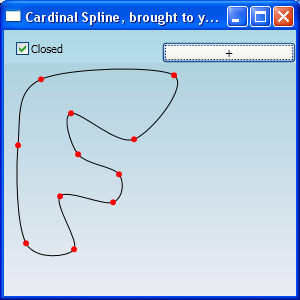 For my project I need to draw Cardinal splines. Preferable the same way I was used to with the System.Drawing.Graphics or System.Drawing.Drawing2D.GraphicsPath. Not knowing much about splines, I noticed the number of PathPoints on a graphics path. The curve is drawn with beziers, so it’s some sort of string of beziers that make up this cardinal spline. This project results in the same curves as you are used to with the graphics object (but this works with doubles not with floats). Tension and open and closed params are supported! Anyway long story short, this project calculates control points for beziers. The curve will be draw with beziers, thus the outcome is exactly the same as with the Graphics object. I’ve seen other examples drawing the curve by them self calculating 100’s of points on the bezier it self . Yes the graphics object does the same thing see msdn (quote:”Remarks The user must keep the original points if they are needed. The original points are converted to cubic Bézier control points internally, therefore there is no mechanism for returning the original points.”) . If you draw a curve with 3 points, 7 points are needed to draw the curve, thus a performance gain(? not measured!) without losing the nice smoothness of the curve. comments are welcome, Can u use this, or are you missing something? This article gives a simpler interface (facade) to use the ArcTo Method… Providing a GraphicsPath AddArc like method. Today I implemented an adapter for GDI+ and WPF to draw similar objects. Simple ons like line, rectangle, ellipse,.. but I kinda struggled with arc??!! Which is all I need anyway. The width and height of an oval whose perimeter is used to draw the angle. If the oval is very rounded in all directions, the arc will be rounded, if it is nearly flat, so will the arc. For example, a very large width and height would represent a very large oval, which would give a slight curvature for the angle. Ehh.. right.. how about just saying radius? The next argument, rotationangle, can be done with a Matrix transform (rotate),.. so why it it there? the way i like it,.. nice and simple. !NOTE! The Angle class is just a simple converter form degrees to radians Nothing to worry about…. Here you can download a sample solution to get the demo working. Or use this Extention Method in a static class..